Wisconsin Avenue and Massachusetts Avenue, N.W., Washington, D.C. The Protestant Episcopal Cathedral Foundation, under the first seven Bishops of Washington, erected the cathedral under a charter passed by the United States Congress on January 6, 1893. Construction began on September 29, 1907, when the foundation stone was laid in the presence of President Theodore Roosevelt and a crowd of more than 20,000, and ended 83 years later when the "final finial" was placed in the presence of President George H. W. Bush in 1990. Decorative work, such as carvings and statuary, is ongoing as of 2011. The Foundation is the legal entity of which all institutions on the Cathedral Close are a part; its corporate staff provides services for the institutions to help enable their missions, conducts work of the Foundation itself that is not done by the other entities, and serves as staff for the Board of Trustees. The cathedral stands at Massachusetts and Wisconsin Avenues in the northwest quadrant of Washington. It is an associate member of the recently organized inter-denominational Washington Theological Consortium. It is listed on the National Register of Historic Places. In 2007, it was ranked third on the List of America's Favorite Architecture by the American Institute of Architects. In 1792, Pierre L'Enfant's "Plan of the Federal City" set aside land for a "great church for national purposes." The National Portrait Gallery now occupies that site. In 1891, a meeting was held to renew plans for a national cathedral. On January 6, 1893, the Protestant Episcopal Cathedral Foundation of the District of Columbia was granted a charter from Congress to establish the cathedral. The 52nd United States Congress declared in the act to incorporate the Protestant Episcopal Cathedral Foundation of the District of Columbia that the "said corporation is hereby empowered to establish and maintain within the District of Columbia a cathedral and institutions of learning for the promotion of religion and education and charity." The commanding site on Mount Saint Alban was chosen. Henry Yates Satterlee, first Episcopal bishop of the Diocese of Washington, chose George Frederick Bodley, Britain's leading Anglican church architect, as the head architect. Henry Vaughan was selected supervising architect. Construction started September 29, 1907, with a ceremonial address by President Theodore Roosevelt and the laying of the cornerstone. In 1912, Bethlehem Chapel opened for services in the unfinished cathedral, which have continued daily ever since. When construction of the cathedral resumed after a brief hiatus for World War I, both Bodley and Vaughan had died. Gen. John J. Pershing led fundraising efforts for the church after World War I. American architect Philip Hubert Frohman took over the design of the cathedral and was thenceforth designated the principal architect. Funding for Washington National Cathedral has come entirely from private sources. Maintenance and upkeep continue to rely entirely upon private support. From its earliest days, the cathedral has been promoted as more than simply an Episcopal cathedral. Planners hoped it would play a role similar to England's Westminster Abbey. They wanted it to be a national shrine and a venue for great services. For much of the cathedral's history, this was captured in the phrase "a house of prayer for all people." In more recent times the phrases "national house of prayer" and "spiritual home for the nation" have been used. The cathedral has achieved this status simply by offering itself and being accepted by religious and political leaders as playing this role. Its initial charter was similar to those granted to American University, Catholic University of America, and other not-for-profit entities founded in the District of Columbia around 1900. Contrary to popular misconception, the government has not designated it as a national house of prayer. During World War II, monthly services were held there "on behalf of a united people in a time of emergency." Before and since, the structure has hosted other major events, both religious and secular, that have drawn the attention of the American people, as well as tourists from around the world. Service of Thanksgiving and Remembrance for Matthew Shepard (October 26, 2018). It was from Washington National Cathedral's "Canterbury Pulpit" that the Reverend Martin Luther King Jr. delivered his final Sunday sermon on March 31, 1968, just a few days before his assassination in April 1968. A memorial service for King was held at the cathedral later the same week. The cathedral was damaged in August 2011 during the Virginia earthquake. Finial stones on several pinnacles broke off, and several pinnacles twisted out of alignment or collapsed entirely. Some gargoyles and other carvings were damaged, and a hole was punched through the metal-clad roof by falling masonry. Cracks also appeared in the flying buttresses surrounding the apse. Inside, initial inspections revealed less damage, with some mortar joints loose or falling out. The cathedral, which had no earthquake insurance, struggled to cope with the cost of the damage. Washington National Cathedral closed from August 24 to November 7, 2011, as $2 million was spent to stabilize the structure and remove damaged or loose stone. Safety netting was erected throughout the nave to protect visitors from any debris that might fall from above. The cathedral reopened for the consecration and installation of Mariann Budde as the ninth Bishop of Washington on November 12, 2011. At that time, estimates of the cost of the damage were about $25 million. Identifying the full extent of the damage and construction planning and studies over the next two years consumed another $2.5 million. In 2011, the cathedral received a $700,000 preservation work matching grant from the Save America's Treasures program, a public-private partnership operated by the nonprofit National Trust for Historic Preservation. The program, which is federally funded, required the cathedral to match the grant dollar-for-dollar with private funds and use the money solely for preservation work. The Reverend Canon Gary R. Hall was chosen to be the 10th dean of Washington National Cathedral in July 2012. Although fundraising to repair the damage began soon after the earthquake, it took the cathedral three years to raise the $15 million to complete the first phase of repairs. In August 2013, the cost of the repairs was re-estimated at $26 million. About $10 million had already been raised by this date to pay for the repairs, half of that coming from the Lilly Endowment. The cathedral began charging a $10 admission fee for tourists in January 2014, and started renting out its worship and other spaces to outside groups to raise cash. The cathedral also transformed the Herb Cottage (its old baptistry building adjacent to the cathedral) into a for-profit coffeehouse operated by the Open City café chain. Phase I of the restoration, which cost $10 million, repaired the internal ceiling's stone and mortar and was completed in February 2015. The planned 10-year, $22 million Phase II will repair or replace the damaged stones atop the cathedral. In June 2015, Washington National Cathedral leaders said the church needed $200 million, which would both complete repairs and establish a foundation to give the cathedral financial stability. The cathedral began working on a capital fundraising campaign, which The New York Times said was one of the largest ever by an American religious institution, to begin in 2018 or 2019. Hall said that the cathedral also planned to reopen its continuing education college and its Center for Prayer and Pilgrimage (a space on the cathedral's crypt level dedicated to prayer, meditation, and devotional practice). After three years of deficit spending, however, the cathedral also announced additional cuts to music programs to balance its budget. In June 2016, after an examination by a five-person task force it was announced that two Confederate battle flag images would be removed from stained glass windows commemorating the lives of Confederate generals Robert E. Lee and Stonewall Jackson. The windows were installed in 1953 after lobbying by the United Daughters of the Confederacy. In its report, the task force wrote that it "is unanimous in its decision that the windows provide a catalyst for honest discussions about race and the legacy of slavery and for addressing the uncomfortable and too often avoided issues of race in America. Moreover, the windows serve as a profound witness to the cathedral's own complex history in relationship to race." On September 6, 2017, the cathedral, in a statement signed by the Right Rev. Mariann Edgar Budde, bishop of the Episcopal Diocese of Washington, the Very Rev. Randolph Marshall Hollerith, dean of the cathedral, and John Donoghue, chair of the cathedral chapter, announced its decision to deconsecrate and remove the stained glass windows honoring Lee and Jackson. In January 2003, the Reverend Nathan D. Baxter, dean of the cathedral, announced his retirement effective from June 30, 2003. Baxter had led the cathedral since 1991. After an 18-month search, Samuel T. Lloyd III was named dean and began his tenure on April 23, 2005. Using a $15 million bequest the cathedral received in 2000, Lloyd rapidly expanded the cathedral's programming. Meanwhile, the cathedral deferred maintenance and declined to make needed repairs. Construction also began in summer 2005 on a $34 million, four-level, 430-car underground parking garage. It opened in 2007. The structure was pushed by John Bryson Chane, bishop of the Episcopal Diocese of Washington, and was mostly funded by debt. Payments on the garage were $500,000 per year, with a major increase in the annual debt service beginning in 2017. In early 2008, the National Cathedral Association, the church's fundraising donor network, was disbanded after cathedral leaders concluded that the building was "finished" and it was no longer necessary to raise significant funds for construction. The 2008–2009 Great Recession hit the cathedral hard. By June 2010, the cathedral cut its budget from $27 million to $13 million, outsourced the operation of its gift shop, shut its greenhouse, cancelled its plans to replace the Skinner organ in the sanctuary, and ceased operation of a college that had provided Episcopal clergy nationwide with continuing theological education. The cathedral also laid off 100 of its 170 staff members, including its art conservator and its liturgist (who researched and advocated the use of liturgies at the cathedral). It also significantly cut back on programming, music performances, and classes. To help stabilize its finances, the cathedral began an $11 million fundraising campaign and used $2.5 million of its $50 million endowment to plug budget holes. The National Cathedral Association was recreated as well. In June 2010, the cathedral announced that it was exploring the sale of its rare book collection, the value of which was estimated to be several million dollars. It sold a number of books to a private collector in 2011 for $857,000 and in 2013 donated most of the remaining collection to Virginia Theological Seminary. As the economic downturn continued, a report by cathedral staff identified $30 million in needed maintenance and repairs. Among the problems were cracked and missing mortar in the oldest sections of the building; broken HVAC, mechanical, and plumbing systems throughout the structure; extensive preservation needs; and a main organ in disrepair. Repointing the building was estimated to cost at least $5 million, while organ repair was set at $15 million. The cathedral's final design shows a mix of influences from the various Gothic architectural styles of the Middle Ages, identifiable in its pointed arches, flying buttresses, a variety of ceiling vaulting, stained-glass windows and carved decorations in stone, and by its three similar towers, two on the west front and one surmounting the crossing. The structure consists of a long, narrow rectangular mass formed by a nine-bay nave with wide side aisles and a five-bay chancel, intersected by a six bay transept. Above the crossing, rising 301 ft (92 m) above the ground, is the Gloria in Excelsis Tower; its top, at 676 ft (206 m) above sea level, is the highest point in Washington. The Pilgrim Observation Gallery—which occupies a space about 3/4ths of the way up in the west-end towers—provides sweeping views of the city. Unique in North America, the central tower has two full sets of bells—a 53-bell carillon and a 10-bell peal for change ringing; the change bells are rung by members of the Washington Ringing Society. The cathedral sits on a landscaped 57-acre (23 ha) plot on Mount Saint Alban. The one-story porch projecting from the south transept has a large portal with a carved tympanum. This portal is approached by the Pilgrim Steps, a long flight of steps 40 feet (12 m) wide. Most of the building is constructed using a buff-colored Indiana limestone over a traditional masonry core. Structural, load-bearing steel is limited to the roof's trusses (traditionally built of timber); concrete is used significantly in the support structures for bells of the central tower, and the floors in the west towers. The pulpit was carved out of stones from Canterbury Cathedral; Glastonbury Abbey provided stone for the bishop's formal seat, the cathedra. The high altar, the Jerusalem Altar, is made from stones quarried at Solomon's Quarry near Jerusalem, reputedly where the stones for Solomon's Temple were quarried. In the floor directly in front of that altar are set ten stones from the Chapel of Moses on Mount Sinai, representing the Ten Commandments as a foundation for the Jerusalem Altar. There are many other works of art including over two hundred stained glass windows, the most familiar of which may be the Space Window, honoring mankind's landing on the Moon, which includes a fragment of lunar rock at its center; the rock was presented at the dedication service on July 21, 1974, the fifth anniversary of the Apollo 11 mission. Extensive wrought iron adorns the building, much of it the work of Samuel Yellin. A substantial gate of forged iron by Albert Paley was installed on the north side of the crypt level in 2008. Intricate woodcarving, wall-sized murals and mosaics, and monumental cast bronze gates can also be found. Most of the interior decorative elements have Christian symbolism, in reference to the church's Episcopal roots, but the cathedral is filled with memorials to persons or events of national significance: statues of Washington and Lincoln, state seals embedded in the marble floor of the narthex, state flags that hang along the nave, stained glass commemorating events like the Lewis and Clark expedition and the raising of the American flag at Iwo Jima. The cathedral was built with several intentional "flaws" in keeping with an apocryphal medieval custom that sought to illustrate that only God can be perfect. [dubious – discuss] Artistically speaking, these flaws (which often come in the form of intentional asymmetries) draw the observer's focus to the sacred geometry as well as compensate for visual distortions, a practice that has been used since the Pyramids and the Parthenon. The architects designed the crypt chapels in Norman, Romanesque, and Transitional styles predating the Gothic, as though the cathedral had been built as a successor to earlier churches, a common occurrence in European cathedrals. Numerous grotesques and gargoyles adorn the exterior, most of them designed by the carvers; one of the more famous of these is a caricature of then-master carver Roger Morigi on the north exterior of the nave. There were also two competitions held for the public to provide designs to supplement those of the carvers. The second of these produced the famous Darth Vader grotesque which is high on the northwest tower, sculpted by Jay Hall Carpenter and carved by Patrick J. Plunkett. The west facade follows an iconographic program of the creation of the world rather than that of the Last Judgement as was traditional in medieval churches. All of the sculptural work was designed by Frederick Hart and features tympanum carvings of the creation of the Sun and Moon over the outer doors and the creation of man over the center. Hart also sculpted the three statues of Adam and Saints Peter and Paul. The west doors are cast bronze rather than wrought iron. The west rose window, often used as a trademark of the cathedral, was designed by Rowan leCompte and is an abstract depiction of the creation of light. LeCompte, who also designed the clerestory windows and the mosaics in the Resurrection Chapel, chose a nonrepresentational design because he feared that a figural window could fail to be seen adequately from the great distance to the nave. The cathedral contains a basement, which was intentionally flooded during the Cuban Missile Crisis to provide emergency drinking water in the event of a nuclear war. The cathedral's master plan was designed by George Frederick Bodley (founder of Watts & Co.), a highly regarded British Gothic Revival architect of the late-19th and early-20th centuries, and was influenced by Canterbury. Landscape architect Frederick Law Olmsted, Jr. contributed a landscaping plan for the cathedral close and Nellie B. Allen designed a knot garden for the Bishop's Garden. After Bodley died in 1907, his partner Henry Vaughan revised the original design, but work stopped during World War I and Vaughan died in 1917. When work resumed, the chapter hired New York architecture firm Frohman, Robb and Little to execute the building. Philip Hubert Frohman, who had designed his first fully functional home at the age of 14 and received his architectural degree at the age of 16, and his partners worked to perfect Bodley's vision, adding the carillon section of the central tower, enlarging the west façade, and making numerous smaller changes. Ralph Adams Cram was hired to supervise Frohman, because of his experience with the Cathedral of St. John the Divine in New York City, but Cram insisted on so many major changes to the original design that Frohman convinced the Cathedral Chapter to fire him. By Frohman's death in 1972, the final plans had been completed and the building was finished accordingly. East End of the cathedral, with the Ter Sanctus reredos, featuring 110 carved figures surrounding the central figure of Jesus. The cathedral is both the episcopal seat of the Bishop of Washington (currently the Right Reverend Mariann Edgar Budde) and the primatial seat of the Presiding Bishop of the Episcopal Church (currently the Most Reverend Michael Curry). Budde was elected by the Diocese of Washington in June 2011, to replace Bishop John Bryson Chane; upon her confirmation in November 2011 she became the ninth bishop of the diocese and the first woman to fill the role. The National Cathedral Association (NCA) seeks to raise and provide funds for and promote the Washington National Cathedral. Across the United States, it has more than 14,000 members, more than 88 percent of whom live outside the Washington area, and who are divided into committees by state. Visitors to the cathedral provide another significant source of funds, through donations and group touring fees. Every year, each state has a state day at the cathedral, on which that state is recognized by name in the prayers. Over a span of about four years, each state is further recognized at a Major State Day, at which time those who live in the state are encouraged to make a pilgrimage to the cathedral and dignitaries from the state are invited to speak. American state flags were displayed in the nave until 2007; currently the display of the state flags alternates throughout the year with the display of liturgical banners hung on the pillars, reflecting the seasons of the Church year. The budget, $27 million in 2008, was trimmed to $13 million in 2010. Staff was reduced from 170 to 70. There was an endowment of $50 million. In May 2016, Randolph Marshall Hollerith was named as the next Dean of the Cathedral. Hollerith comes to the National Cathedral from St. James Episcopal Church, where he was rector from 2000–2016. The worship department is, like the cathedral itself, rooted in the doctrine and practice of the Episcopal Church, and based in the Book of Common Prayer. Three services are held each weekday, including the daily Eucharist. Sunday through Thursday, the cathedral choirs sing Evensong. The 40-minute service is attended by roughly 50 to 75 people, with more on Sunday. Three services of the Eucharist are held on Sunday, along with Choral Evensong. The cathedral also has been a temporary home to several congregations, including a Jewish synagogue and an Eastern Orthodox community. It has also been the site for several ecumenical and interfaith services. In October 2005, at the cathedral, the Rev. Nancy Wilson was consecrated and installed as moderator (denominational executive) of the Metropolitan Community Church, by its founding moderator, the Rev. Troy Perry. Each Christmas, the cathedral holds special services, which are broadcast to the world. The service of lessons and carols is distributed by Public Radio International. Christmas at Washington National Cathedral is a live television broadcast of the 9:00 a.m. Eucharist on Christmas Day. It is produced by WJLA-TV and is shown on national affiliates in most cities around the United States. Some affiliates broadcast the service at noon. The Christmas service at the Cathedral was broadcast to the nation on television from 1953 until 2010 and is still webcast live from the cathedral's homepage. The Washington National Cathedral Choir of Men and Boys, founded in 1909, is one of very few cathedral choirs of men and boys in the United States with an affiliated school, in the English choir tradition. The 18–22 boys singing treble are of ages 8–14 and attend St. Albans School, the Cathedral school for boys, on vocal scholarships. In 1997, the Cathedral Choir of Men and Girls was formed by Bruce Neswick, using the same men as the choir of the men and boys. The Choir consists of middle and high school girls attending the National Cathedral School on vocal scholarships. The two choirs currently share service duties and occasionally collaborate. The console of the Great Organ at Washington National Cathedral in 2010. It includes four manuals: the Choir, Great, Swell, and Solo. It is located in the Great Choir. Both choirs have recently[when?] recorded several CDs, including a Christmas album; a U.S. premiere recording of Ståle Kleiberg's Requiem for the Victims of Nazi Persecution; and a patriotic album, America the Beautiful. The choirs rehearse separately every weekday morning in a graded class incorporated into their school schedule. The choristers sing Evensong five days a week (the Boys Choir on Tuesdays and Thursdays and the Girls Choir on Mondays and Wednesdays). The choirs alternate Sunday worship duties, singing both morning Eucharist and afternoon Evensong when they are on call. The choirs also sing for numerous state and national events. The choirs are also featured annually on Christmas at Washington National Cathedral, broadcast nationally on Christmas Day. The Great Organ was installed by the Ernest M. Skinner & Son Organ Company in 1938. The original instrument consisted of approximately 8,400 pipes. The instrument was enlarged by the Aeolian-Skinner Organ Company in 1963 and again between 1970 and 1975, during which time more than half of the original instrument was removed. The present instrument consists of 189 ranks and 10,647 pipes. The organ was to be replaced with a new instrument built by Dobson Pipe Organ Builders, but this plan was scrapped in 2009. As of 2018, it is currently unknown whether the organ replacement will take place. Michael McCarthy is the Director of Music, George Fergus is the Cathedral Organist and Associate Director of Music, and Jeremy Filsell is the Artist-in-Residence. The carillonneur is Edward M. Nassor. Former organists and choirmasters include Edgar Priest, Robert George Barrow, Paul Callaway, Richard Wayne Dirksen, Douglas Major, Bruce Neswick, James Litton, Erik Wm. Suter, and Scott Dettra. The resident symphonic chorus of Washington National Cathedral is the Cathedral Choral Society. The cathedral is unique in North America in having both a carillon and a set of change ringing bells. The ring of 10 bells (tenor 32 long cwt 0 qr 4 lb; 3,588 lb or 1,627 kg in D) are hung in the English style for full circle ringing. All ten were cast in 1962 by Mears & Stainbank (now known as The Whitechapel Bell Foundry) of London, England. The carillon has 53 bells ranging from 17 pounds (7.7 kg) to 24,000 pounds (11,000 kg) and was manufactured by John Taylor & Co of Loughborough, England in 1963. The bells are hung dead, meaning rigidly fixed, and are struck on the inside by hammers activated from the keyboard. Woodrow Wilson, 28th President of the United States. Wilson's tomb includes variants on the Seal of the President of the United States and the coat of arms of Princeton University. Wilson is the only American president buried in the District of Columbia. Only one other church in the United States contains a presidential tomb: the United First Parish Church in Quincy, Massachusetts, where the remains of both John Adams and his son John Quincy Adams, together with their first ladies, are buried in a family vault. ^ Episcopal Church (1990). Consecration of the Cathedral Church of Saint Peter and Saint Paul in the City and Diocese of Washington: A Litany of Thanksgiving : Celebration of the Holy Eucharist ... : Sunday, September Thirtieth, Nineteen Hundred and Ninety, at Eleven O'clock. The Cathedral. Retrieved April 6, 2013. ^ The Episcopal Church Center (2011). "Cathedral Church of Saint Peter and Saint Paul in the City and Diocese of Washington". Retrieved April 6, 2013. ^ a b c d e f "Facts & Figures". Washington National Cathedral. ^ "Annual Report: Highlights". Washington National Cathedral. 2016. Retrieved April 23, 2018. ^ Quinn, Fredrick (October 1, 2014). A House of Prayer for All People: A History of Washington National Cathedral. Church Publishing, Inc. p. 3. ISBN 9780819229243. The quest for a National Cathedral, the best-known endeavor of Satterlee's episcopate, had deep roots in American national life. Major Pierre L'Enfant envisioned "a great church for national purposes" in his original plans for the city of Washington, but nothing came of the idea. After several meetings of leading Washington figures, including planning sessions in the home of Charles C. Glover, president of the Riggs Bank, the Protestant Episcopal Church Foundation was created on January 6, 1893, by Act of Congress, signed by President Benjamin Harrison. ^ "Member Institutions". Washington Theological Consortium. Retrieved October 2, 2009. ^ Clark, Jayne (June 21, 2007). "National Cathedral celebrates its centennial". USA Today. ^ United States Secretary of State (1893). "An Act to incorporate the Protestant Episcopal Cathedral Foundation of the District of Columbia" (PDF). The Statutes At Large of the United States of America, From December, 1891, To March, 1893, And Recent Treaties, Conventions, and Executive Proclamations. United States Congress. p. 414. Retrieved November 16, 2014. ^ F, Morales, Teresa (2013). The Last Stone is Just the Beginning: A Rhetorical Biography of Washington National Cathedral (Thesis). Georgia State University. ^ a b c d "Presidential Funerals". Washington National Cathedral. ^ Johnson, Cynthia (November 30, 2018). "Former President George HW Bush dies at 94; Trump designates Wednesday as national day of mourning, markets to close". CNBC. Retrieved December 1, 2018. ^ Miller, Zeke; Lucey, Catherine (December 1, 2018). "Trumps to attend state funeral for George H.W. Bush". The Washington Post. Retrieved December 1, 2018. ^ "Presidential Inaugural Prayer Services at Washington National Cathedral". Washington National Cathedral. Archived from the original on April 2, 2016. ^ "The 58th Presidential Inaugural Prayer Service". Washington National Cathedral. Retrieved April 23, 2018. ^ "Charles W. Colson funeral". Washington Post. Retrieved October 27, 2018. ^ "March for Our Lives Prayer Vigil". Washington National Cathedral. Retrieved March 23, 2018. ^ "Celebration of Life and Interment for Matthew Wayne Shepard". ^ Martin Luther King, Jr. (March 31, 1968). "Remaining Awake Through a Great Revolution". Retrieved June 14, 2011. ^ a b "D.C. earthquake damages National Cathedral, Washington Monument". WJLA-TV. August 25, 2011. Retrieved August 18, 2011. ^ a b c d e f g h i j k l m Fandos, Nicholas (July 4, 2015). "National Cathedral's Repair Work: Finials, Finance and Faith". The New York Times. Retrieved July 5, 2015. ^ Hill, Daniel (September 1, 2011). "National Cathedral Adds Safety Netting". The Washington Times. Retrieved July 5, 2015. ^ a b Ruane, Michael E. (October 5, 2011). "Cathedral Seeks to Raise $25 Million". The Washington Post. p. B1. ^ Trescott, Jacqueline (February 2, 2011). "National Cathedral, Renwick Gallery Win Federal Funds". The Washington Post. Retrieved July 5, 2015. ^ "Gary R. Hall named dean of Washington National Cathedral". Episcopal Church. July 31, 2012. Retrieved April 23, 2018. ^ "National Cathedral Earthquake Repairs to Top $26 million". WJLA-TV. August 22, 2013. Retrieved July 5, 2015. ^ Boorstein, Michelle (January 15, 2014). "National Cathedral Opens Worship Space to Free Classes and More to Boost Profile, Coffers". The Washington Post. ^ Marmer, Gerri (December 5, 2014). 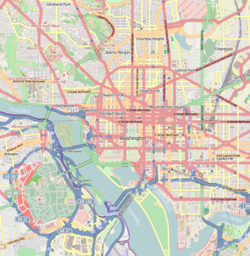 "Religion Events From Around the Washington Area". The Washington Post. ^ "Making Washington's National Cathedral Whole Again" (video). Fox News. April 5, 2015. Retrieved April 6, 2015. ^ "Cathedral to Explore Racial Justice Through Public Forums, Arts, Worship". Washington National Cathedral. Retrieved October 25, 2016. ^ Budde, Mariann Edgar; Hollerith, Randolph Marshall; Donoghue, John (September 6, 2017). "Announcement on the Future of the Lee-Jackson Windows". Washington National Cathedral. Retrieved September 6, 2017. ^ "Baxter plans to step down as dean of National Cathedral" (Press release). The Episcopal Church. January 23, 2003. ^ "The Very Rev. Samuel T. Lloyd III". Washington National Cathedral. ^ Murphy, Caryle (March 18, 2000). "Rockville Woman Leaves $15 Million to Cathedral". The Washington Post. p. B3 – via ProQuest Archiver. ^ "Washington, D.C.: Cathedral opens first underground bus garage in nation's capital" (Press release). The Episcopal Church. May 11, 2007. Retrieved April 23, 2018. ^ a b c Zongker, Brett (March 14, 2012). "National Cathedral's Preservation, Financial Needs Top $50 Million". Associated Press. Retrieved July 5, 2015 – via NBC4 Washington. ^ "History: National Cathedral Association". Washington National Cathedral. Retrieved April 23, 2018. ^ a b c d Gowen, Annie (June 11, 2010). "National Cathedral finds itself in a bind". The Washington Post – via Boston.com. ^ Sullivan, Patricia (July 8, 2011). "The Very Rev. Samuel Lloyd, dean of Washington National Cathedral, to resign". The Washington Post. ^ "Bishop Payne Library Receives Large Collection of Rare Books from the Washington National Cathedral" (Press release). Virginia Theological Seminary. January 25, 2013. Retrieved July 5, 2015. ^ "The Space Window at the U.S. National Cathedral". space.com. September 12, 2012. Retrieved September 16, 2012. ^ "Darth Vader 'Gargoyle'". Washington National Cathedral. ^ Graff, Garrett M. (2017). Raven Rock: The Story of the U.S. Government's Secret Plan to Save Itself - While the Rest of Us Die. Simon & Schuster. ^ "High Altar". Washington National Cathedral. ^ Hollerith, Randy. "Hollerith named next Dean of National Cathedral". Archived from the original on August 6, 2016. Retrieved May 23, 2016. ^ Rockett, Ali (May 23, 2016). "St. James's Episcopal Church rector named dean of Washington National Cathedral". Richmond Times-Dispatch. Retrieved May 23, 2016. ^ "Worship at the Cathedral: Services Schedule". Washington National Cathedral. Retrieved April 23, 2018. ^ "Washington National Cathedral". American Guild of Organists: District of Columbia Chapter. Retrieved April 23, 2018. ^ "Fans Pipe Up About Replacing Venerable Cathedral Organ". The Washington Post. Retrieved December 16, 2018. ^ "Washington National Cathedral : Organ Project". Web.archive.org. Retrieved December 16, 2018. ^ "Specifications for the Great Organ" (PDF). Washington National Cathedral. March 2016. ^ "Music Staff". Washington National Cathedral. ^ "Washington, Cath Ch of S Peter & S Paul". Dove's Guide for Church Bell Ringers. Retrieved November 29, 2012. ^ "Carillon". Washington National Cathedral. Retrieved April 23, 2018. ^ Victoria., Dawson, (2008). Washington National Cathedral guidebook. Vochinsky, Eric., Washington National Cathedral (Washington, D.C.). Washington, D.C.: Washington National Cathedral. ISBN 9780615236124. OCLC 880900586. ^ Christine Hauser, Shepard Laid to Rest at National Cathedral Decades After His Murder, nytimes.com, October 26, 2018. David Hein, Noble Powell and the Episcopal Establishment in the Twentieth Century. Foreword by Peter W. Williams. Urbana: Univ. of Illinois Press, 2001; Eugene, Ore.: Wipf & Stock, 2007. Includes a chapter on Powell when he was dean of WNC and warden of the College of Preachers. What does Darth Vader have to do with the Cathedral?